Ground was broken last week on a new chapel at the Paynesville Area Health Care System, which is the first project of the four-year-old Paynesville Area Hospital Foundation, a fundraising organization for PAHCS. 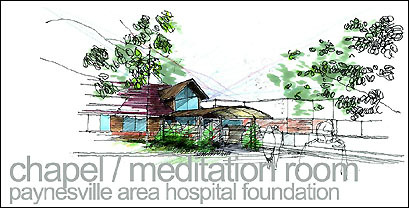 The 15' by 22' room will be located between the hospital and 700 Stearns Place, it will have comfortable seating for eight, and will have skylights and large glass windows facing the center courtyard at PAHCS's main campus in Paynesville, which includes the Paynesville Area Hospital, the Paynesville Area Medical Clinic, the Koronis Manor (a nursing home), and 700 Stearns Place (senior apartments). It is meant to be a private space for self-reflection for families during traumatic times, for residents at 700 Stearns Place or the Koronis Manor or patients at the hospital, and for staff. One staff member has already indicated that she plans to start and finish her day with prayers in the chapel, according to Jennifer Shinn, foundation director for PAHCS. The Paynesville Area Hospital Foundation held its first meeting in January 2002, four years ago, and identified a chapel as a worthy first project. The Paynesville Area Hospital, which opened its door in the fall of 1956, 50 years ago this year, has never taxed, relying on its income from operations. The foundation, as a fundraising arm, is dedicated to raising money for projects, like the chapel, which satisfy a need but are not regularly funded. Addressing patients' spiritual needs, as well as their medical condition, has always been a part of good medicine, said Dr. Ray Lindeman, who actively practiced medicine in Paynesville for 45 years and now serves on the foundation's board of directors. "It's always been a need," he explained. "How it's been met has varied. Nowadays, people expect (a dedicated chapel)." When her mother was dying at the Koronis Manor, added foundation board member Carolyn Swyter, her family had to sit in a dining room. Members of the Paynesville Area Hospital Foundation Board of Directors broke ground for the new chapel on Tuesday, April 11. 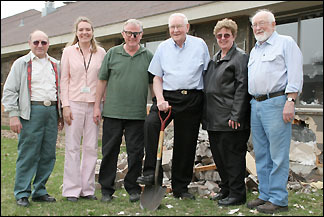 They are, from left: Richard Fleischhacker; Jennifer Shinn, volunteer coordinator and foundation director; Joe Musel; Don Torbenson; Carolyn Swyter; and Dr. Ray Lindeman. Having the foundation raise the money for this project allows PAHCS to focus on medical care, which has enough capital needs these days, added Lindeman. Besides, a chapel might not be important to some taxpayers, so fundraising for it might be a better way to pay for it anyway. So far, said Shinn, the foundation has raised $66,000 for the chapel, which is expected to cost $80,000. The foundation will be holding its second annual golf tourney on Tuesday, May 16, and will hopefully reach its fundraising goal then, Shinn added. Demolition of the existing room began on Tuesday, April 11, and the ceremonial groundbreaking was held the same day. The chapel is expected to be finished by the end of May, said PAHCS facilities manager Scott Crawford. Future foundation projects will include raising funds for a patio from the chapel into the courtyard.